Hindi in the Devanagari script is the official language of the Union and English the "subsidiary official language". ‡ This is the figure as per the United Nations though the Indian government lists the total area as 3,287,260 square kilometres. 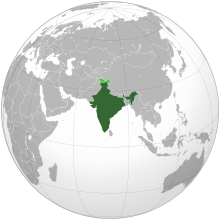 India, officially the Republic of India , is a country in South Asia. It is the seventh-largest country by geographical area, the second-most populous country, and the most populous democracy in the world. Bounded by the Indian Ocean on the south, the Arabian Sea on the west, and the Bay of Bengal on the east, India has a coastline of 7,517 kilometres . It is bordered by Pakistan to the west; People's Republic of China, Nepal, and Bhutan to the north; and Bangladesh and Myanmar to the east. India is in the vicinity of Sri Lanka, the Maldives, and Indonesia in the Indian Ocean. India is a republic consisting of 28 states and seven union territories with a parliamentary system of democracy. It has the world's twelfth largest economy at market exchange rates and the fourth largest in purchasing power. Economic reforms since 1991 have transformed it into one of the fastest growing economies; however, it still suffers from high levels of poverty, illiteracy, disease, and malnutrition. A pluralistic, multilingual, and multiethnic society, India is also home to a diversity of wildlife in a variety of protected habitats.